A poll released Wednesday revealed that a majority of Americans would like an independent candidate to challenge the two major parties if November’s general election comes down to presumptive presidential nominees Donald Trump and Hillary Clinton. Based on 2,153 interviews, Friday’s poll results suggest a strong potential for a third-party candidate – like Gary Johnson of the Libertarian Party or Jill Stein of the Green Party – to take enough of the vote in the Nov. 8 presidential election to influence its outcome. According to the July 1-8 poll, 21 percent of likely voters will not back Trump or Clinton. That compares with about 13 percent of likely voters who opted out of the two main choices at the same point in the 2012 race between incumbent President Barack Obama and Republican challenger Mitt Romney. The poll also showed a majority of American voters have an overall “unfavorable” view of both main candidates, with 46 percent of Clinton supporters and 47 percent of Trump supporters saying their top priority when voting will be to stop the opposing candidate from reaching the White House. The poll, conducted by Data Targeting, found that 55% of respondents preferred a third party option, while 65% said they would be willing to support any candidate but Trump or Clinton. Clinton was revealed to be more disliked than Trump, with 56% of voters viewing her unfavorably to his 55%, placing both at the top of the list of the most disliked candidates in recent history. Among millennials, who overwhelmingly favor Senator Bernie Sanders, the dislike of the two front-runners is even higher. About 91% of voters under the age of 29 stated that they would vote for an independent candidate over Trump or Clinton. According to a ballot test, an independent candidate would immediately begin her or his candidacy with 21% of the vote. Pollsters reached out to 997 respondents between May 12 and 15, and the poll has a margin of error of plus or minus 3.1 percentage points. Demand for an alternative could be decisive in hotly contested battleground states. In Florida in 2012, for instance, Obama won by less than 1 percentage point. If this year’s race is just as tight, third-party candidates could draw enough support to flip the state from one major party to the other. The Reuters/Ipsos poll is conducted online in English with American adults in the continental United States, Alaska, and Hawaii. The survey of voters who want an alternative to Trump and Clinton included 2,153 likely voters and has a credibility interval, a measure of accuracy, of 2 percentage points. The five-day average poll that ended July 8 included about 1,240 likely voters and has a credibility interval of 3 percentage points. PRINCETON, NJ — A majority of U.S. adults, 58%, say a third U.S. political party is needed because the Republican and Democratic parties “do such a poor job” representing the American people. These views are little changed from last year’s high. Since 2007, a majority has typically called for a third party. The results are based on Gallup’s Sept. 4-7 Governance poll. The first time the question was asked in 2003, a majority of Americans believed the two major parties were adequately representing the U.S. public, which is the only time this has been the case. Since 2007, a majority has said a third party is needed, with two exceptions occurring in the fall of the 2008 and 2012 presidential election years. The historical 60% high favoring a third party came in a poll conducted during the partial federal government shutdown last October. At that time, 26% of Americans said the parties were doing an adequate job. That figure is up to 35% now, but with little change in the percentage calling for a third party. Americans’ current desire for a third party is consistent with their generally negative views of both the Republican and Democratic parties, with only about four in 10 viewing each positively. Americans’ views toward the two major parties have been tepid for much of the last decade. However, even when the party’s images were more positive in the past, including majority favorability for the Democrats throughout 2007 and favorability for the GOP approaching 50% in 2011, Americans’ still saw the need for a third party. Independents Maintain Solid Preference for Third Party: Political independents, as might be expected given a lack of allegiance to either major party, have shown a far greater preference for a third political party than those who identify as Republicans or Democrats. Currently, 71% of independents say a third party is needed, on the upper end of the trend line. That compares with 47% of Democrats and 46% of Republicans who say the same. For most of the past 11 years, Republicans and Democrats were about equally as likely to favor a third party. From 2003 to 2006 — when Republicans had control of the presidency and both houses of Congress — Democrats were more likely than Republicans to see the need for a third party. And in 2011, after the rise of the Tea Party movement, Republicans were a bit more inclined than Democrats to see a third party as necessary. 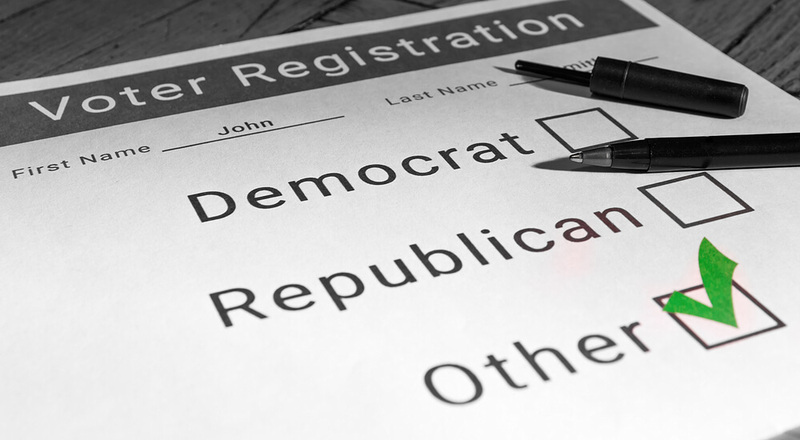 Implications: Although Americans express a desire for a viable alternative to the Democratic and Republican parties, third political parties have had little success in American politics. The U.S. political system makes it difficult for third parties to hold elected office given the Electoral College system of electing presidents and election of members of Congress from individual states and districts based on the candidate getting the most votes. Such a system generally favors two parties — a center-right and a center-left party — that have the ability to assemble a winning plurality or majority in districts and states across the country. Also, some states have restrictive laws on ballot access that make it difficult for third-party candidates to appear on the ballot. Though the desire for a third party exists, it is unclear how many Americans would actually support a third party if it came to be. Americans’ preference for a third party may reflect their frustration with the way the Republican and Democratic parties are performing, as well as the idea that the system ought to be open to new parties, regardless of whether this is viable in practice. Though both the Democrats with the criminal Hillary and the Republicans with the lying racist Trump prefer not to have the need to compete against a third party, 2016 looks like it will be the year for the unknown, and the unexpected. 2016 could be the year that an independent or another candidate may just pull through and win the election. #nevertrump voters will never choose Trump and they are republicans while we see the #neverhillary democrats actively looking for something better than Hillary Clinton.